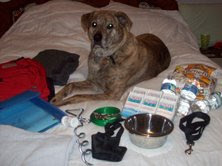 Daily Survival: 72-hour kits: For pets? A few months ago, we asked you to send in pictures of your progress, whether it was your 3-month supply, longer term storage, car kits, 72-hour kits, or whatever. One of our readers, Jacki, sent us an interesting email of something that we hadn't really thought of before: 72-hour kits for your pets. Now, in talking with several people I've heard mixed opinions. A few people told me that in some emergencies, they would not take their pets with them; in most cases, it was because they have little kids and they could barely imagine carrying enough stuff for them, let alone a pet too (please don't come after me, PETA. I didn't say this. I don't even have a pet...). Other people have said that they would take their pet(s) with them no matter what. Whatever your opinion is, it's an important thing to think about if you have a pet. And even if you wouldn't take your pet in some situations, you should still think about stocking up some food and supplies for them for other reasons. Anyway, here is a portion of the email we received, beginning with a list of what she put in her dog's 72-hour kit. Water –he’s a big boy and drinks a lot! Since I took the photo I’ve added a towel to his kit. We’re still putting together the cat’s kit. Also, for emergencies, his collar includes not just his license and rabies tag, but also a tag with my phone (land line and cell) and an out of town number just in case. He also has an embedded microchip should he lose his collar. I had never thought about our pets in our emergency plans until one day while proudly showing off our 3-month supply to my daughter she made this observation: "What's Hunter going to eat? If we have to share this with him, it's not going to last three months!" Thanks again for your email, Jacki. This is valuable information for anyone who has a pet!